The legume-rhizobia symbiosis leads to the formation of novel organs on the plant root, termed nodules. Rhizobia within nodule cells differentiate into bacteroids that fix atmospheric dinitrogen in exchange for plant carbohydrates. The symbiotic signalling process is initiated when rhizobia secrete nodulation (Nod) factors upon sensing flavonoids produced by compatible legumes. Lotus japonicus Nod factor receptors NFR1 and NFR5 and the corresponding proteins LYK3 and NFP in Medicago truncatula and, GmNFR1 and GmNFR5 in soybean [1–8] are crucial for perception of rhizobial Nod factors. Rhizobia enter into roots through infection threads (ITs) that, in most cases, initiate in epidermal root hair cells and progress to inner root tissues (reviewed in ). Formation of functional nodules requires two separate but tightly coordinated developmental processes: bacterial infection and nodule organogenesis. Protein ubiquitination has been identified as being critical for these two signalling pathways. Ubiquitination of proteins, by which proteins are tagged by ubiquitin and subsequently destined to be degraded by the proteasome, is a regulatory process essential for eukaryotic growth, development and response to interacting microbes . In some cases, ubiquitination is important for regulating the activity or trafficking of the target protein . Post-translational modification by ubiquitination is accomplished by a three-step process that involves ATP-dependent activation of ubiquitin by an E1 enzyme, followed by conjugation by an E2 enzyme and specific ubiquitin ligation to substrate proteins by direct interaction by an E3 ligase [12, 13]. E3 ligases are divided into families based on their mechanism of action and on the presence of specific E2 interacting domains, such as HECT, RING and U-box (reviewed in [14, 15]). The largest class of plant U-box (PUB) proteins is the ARMADILLO (ARM) domain-containing PUB proteins that contain tandemly-repeated ARM motifs located at the C-terminal [16, 17]. ARM repeat proteins are known to be involved in a number of different cellular processes including signal transduction, cytoskeletal regulation, nuclear import, transcriptional regulation, and ubiquitination. PUB-ARM proteins have been implicated in plant receptor-like kinase (RLK) signalling, with the ARM repeat domain mediating the binding of PUBs to the kinase domain [17, 18]. E3 ligases have been shown to play roles in the establishment of legume-rhizobium symbiosis (reviewed in ). M. truncatula LIN  and the orthologous gene from L. japonicus, CERBERUS , encode E3 ligases containing U-box, ARM and WD-40 repeats, and have been reported to control rhizobial infection inside root hairs. A second PUB-ARM E3 ubiquitin ligase in M. truncatula, MtPUB1, was identified as a negative regulator of nodulation by direct interaction with the receptor-like kinase LYK3 . M. truncatula PUB1 is required for both rhizobial and arbuscular mycorrhiza (AM) endosymbiosis as it also directly interacts with the receptor kinase DMI2, a key component of the common symbiosis signalling pathway . A member of the SEVEN IN ABSENTIA (SINA) family of E3 ligases, SINA4, was shown to interact with SYMRK receptor-like kinase in L. japonicus and be a negative regulator of rhizobial infection . LjnsRING, a RING-H2 E3 ubiquitin ligase from L. japonicus, was also reported to be required for both rhizobial infection and nodule function . Nevertheless, the mechanistic mode of action of the E3 ligases in the symbiotic interactions has not been elucidated, and the targets of all the symbiotic E3 ligases remain to be identified. Here, we report the involvement of a PUB-ARM protein, LjPUB13, in the symbiotic interaction of L. japonicus with rhizobia. LjPUB13 is phylogenetically a close relative of Arabidopsis PUB13, which has been implicated in plant responses to bacterial flagellin (flg22)  and, recently, fungal long-chain chitooligosaccharides (chitooctaose) . In L. japonicus, LjPUB13 is involved in the establishment of a successful symbiosis, through the interaction of its ARM domain with the Nod factor receptor NFR5 and direct ubiquitination of the NFR5 kinase domain. A Lotus japonicus sequence encoding for a novel ARMADILLO repeat-containing protein was initially identified as the TC63883 in the DFCI Gene Index Database (http://compbio.dfci.harvard.edu/tgi/tgipage.html), while searching for ARMADILLO repeat proteins in L. japonicus. Initial search at transcript data in Lotus Base (https://lotus.au.dk) showed that this gene is expressed in nodules. The predicted protein has a typical Plant U-box (PUB) E3 ubiquitin ligase sequence with a U-box motif followed by a C-terminal ARMADILLO (ARM) repeat domain (Fig. 1a). It encodes a 671 aminoacid long protein with an estimated molecular mass of 73 kDa. Phylogenetic analysis showed that this protein is distinct from other previously characterised PUBs in legumes, but it is the closest homolog to Arabidopsis thaliana PUB13 (Additional file 1: Figure S1 and S2). We therefore designated the protein as LjPUB13. The encoded polypeptide shares 69% and 65% amino acid identity with AtPUB13 (AT3G46510) and AtPUB12 (AT2G28830), respectively. At the genomic level, this gene displays an exon-intron structure similar to AtPUB13 , but different from AtPUB12 (www.arabidopsis.org), with four exons spanning a 4547 bp region on chromosome 3 (Fig. 1a). 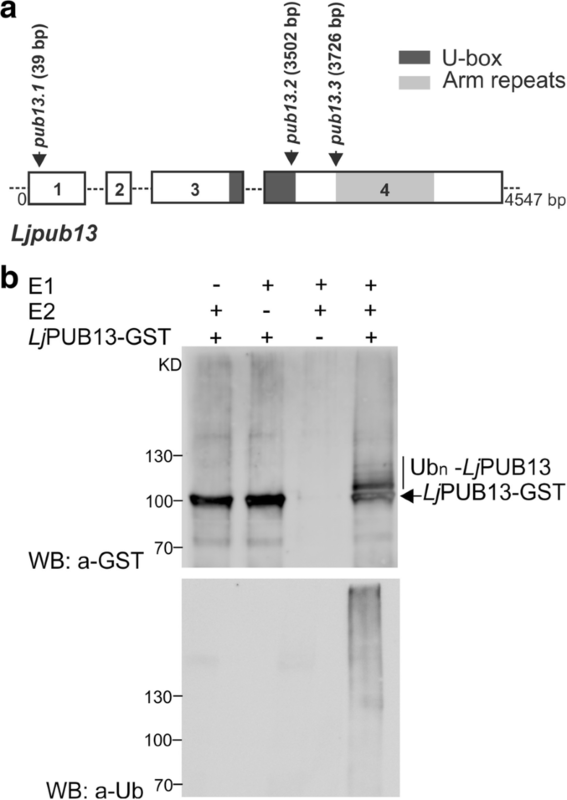 The predicted E3 ligase enzymatic activity of LjPUB13 was analysed by an in vitro ubiquitination assay, performed with LjPUB13 purified as a glutathione S-transferase (GST) fusion protein from Escherichia coli. Incubation of LjPUB13 with E1 ubiquitin-activating and E2 ubiquitin-conjugated enzymes, ubiquitin and ATP resulted in LjPUB13 polyubiquitination (Fig. 1b). 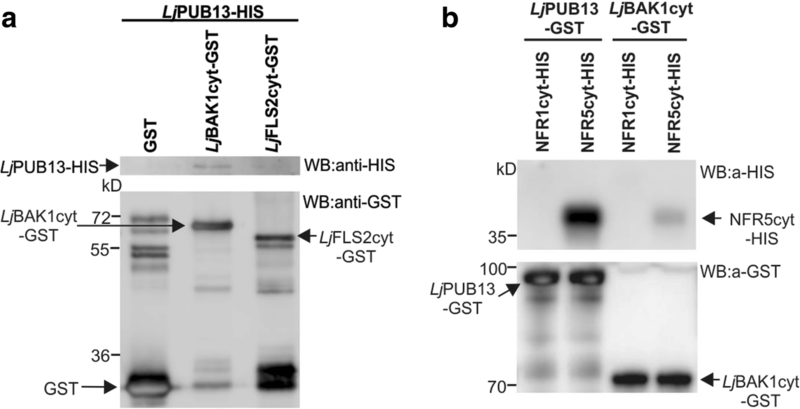 Bands with a larger molecular weight than LjPUB13-GST and a protein ladder were detected by anti-GST and anti-ubiquitin antibodies, respectively, when LjPUB13 was added to the reaction (Fig. 1b, lane 4). The observed E3 ligase activity was abolished in the absence of E1 or E2 enzymes (Fig. 1b, lanes 1 & 2). These results show that L. japonicus PUB13 is a functional E3 ligase, possessing auto-ubiquitination activity. To test if LjPUB13 is regulated during symbiosis, we monitored its transcript levels in roots and nodules at 7, 14, 21 and 28 days post inoculation (dpi) with Mesorhizobium loti. No significant increase was detected in inoculated plants compared to uninoculated ones. Functional nodules, in general, had approximately 2 times less LjPUB13 transcript compared to roots (Fig. 2a). To complement the results from gene transcript analysis, we constructed a LjPUB13pro::GUS fusion and analysed the spatial and temporal regulation of LjPUB13 promoter activity in Agrobacterium rhizogenes transformed roots expressing the transgene. In both uninoculated and inoculated roots, the LjPUB13 promoter was active throughout the whole root, but strongest in the vascular bundle (Fig. 2b) and at the lateral root initiation sites (Fig. 2c). In M. loti inoculated plants, an increase in the promoter activity in the root zones, where nodule primordia formation occurs, was observed (Fig. 2d). Although strong LjPUB13Pro::GUS expression was detected in young developing nodules at 7 dpi (Fig. 2d), in the fully developed mature nodules (28 dpi), LjPUB13Pro::GUS expression was restrained to the nodule-root connection zone (Fig. 2f). 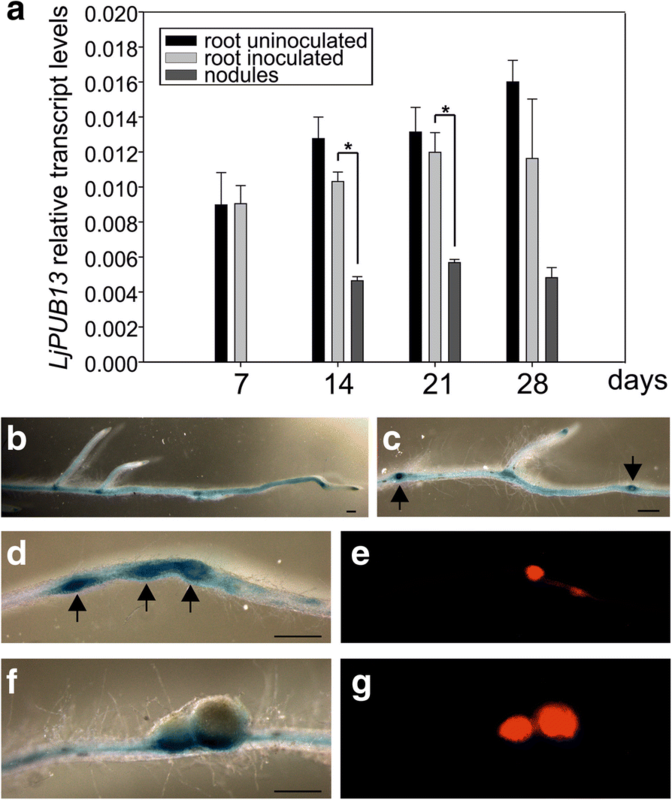 Collectively, these results illustrate that LjPUB13 transcript is present in symbiotically active root and young nodule tissues. To investigate whether LjPUB13 plays a role in the interaction between L. japonicus and the M. loti symbiont, we identified three mutant lines that possess LORE1 retroelement insertions [29, 30] in LjPUB13 (Fig. 1a) and homozygous insertion lines were obtained for phenotypic analyses. The expression levels of LjPUB13 in uninoculated plants of pub13.1, pub13.2 and pub13.3 mutant lines are 4-, 4.5- and 19-fold reduced, respectively, compared to wild-type plants of the same age (Additional file 1: Figure S3). We observed that in the absence of the M. loti symbiont, L. japonicus pub13 mutants displayed a reduced growth phenotype; the root and shoot length are significantly shorter in all pub13 mutants when compared to wild type plants of the same age (Fig. 3). In the presence of M. loti, pub13 mutants formed a significantly lower number of nodules compared to the wild type Gifu, both in absolute number (Fig. 4a) and when normalized to root length (Fig. 4b). The latter indicates that the reduced nodulation phenotype does not correlate to the shorter root phenotype and is further supported by the direct comparison of pub13.1 with the har1 hypernodulation mutant [31, 32], where in har1 very short roots (shorter than pub13.1) a high number of nodules is formed (Additional file 1: Figure S4). Notably, nodulation was not only significantly reduced but also delayed in pub13 mutants (Fig. 4c, Additional file 1: Figure S5). At 14 dpi only 15% of pub13–1 and pub13–2 plants had initiated symbiosis and had nodules compared to approximately 60% of wild type plants. This frequency in nodule appearance in the different plants of each plant line was higher at later stages of nodulation (Fig. 4c). Sections of mature nodules showed that they were fully infected and morphologically normal (Additional file 1: Figure S6). In addition, the root infection process was not evidently perturbed in the L. japonicus pub13 mutants since both wild type plants and pub13 mutants formed a similar number of infection threads in root hairs (Fig. 4d). Together, these results show that LjPUB13 is involved in plant growth and nodule organogenesis. Based on its gene structure, amino acid identity and phylogenetic relationship, LjPUB13 could be considered a putative ortholog of AtPUB13 in L. japonicus. In Arabidopsis, a number of phenotypes have been reported for Atpub13 mutants, which primarily indicates for a role in PTI (pathogen-associated molecular patterns (PAMP)/pattern-triggered immunity) response to flg22 treatment [26, 33]. Although the studies in Arabidopsis were focused in leaves, we searched for similar functions in L. japonicus roots as our aim was to investigate the function of LjPUB13 in root responses to interacting microbes or microbial signals. Firstly, we investigated the involvement of LjPUB13 in the induction of reactive oxygen species (ROS) after flg22 treatment. Our analysis of wild type and pub13 mutant roots revealed that similar levels of ROS were produced by wild type and mutant L. japonicus plants after treatment with 0.5 μM flg22 (Additional file 1: Figure S7). Secondly, we analysed the transcriptional activation of the defence marker genes LjMPK3, LjPEROXIDASE and LjPR1, together with LjFLS2 and LjBAK1 after 1-h treatment with flg22. All marker genes were induced in the treated samples (Additional file 1: Figure S8); LjMPK3, LjPEROXIDASE and LjPR1 had a 4- to 6-fold increase in transcript levels while a 2- to 3-fold increase was observed for LjFLS2 and LjBAK1. Nevertheless, the expression levels of these marker genes were comparable in wild type and pub13 mutants in both treated and non-treated samples (Additional file 1: Figure S8), suggesting that L. japonicus pub13 mutants neither express immunity-related genes constitutively nor overexpress them in the presence of flg22 as seen in Arabidopsis mutants . Collectively, these results show that in L. japonicus roots the PUB13 gene is not directly involved in PTI responses induced by flg22. It is known that in Arabidopsis, PUB13, phosphorylated by BAK1 in the presence of flg22, polyubiquitinates the FLS2 receptor. This results in FLS2 degradation and regulation of the PTI signalling downstream of FLS2-BAK1 . The apparent absence of PUB13-dependent PTI responses in L. japonicus roots prompted us to investigate the molecular basis of this differential response in L. japonicus. We identified the corresponding L. japonicus BAK1, and the LjBAK1cyt-GST or LjFLS2cyt-GST fusion proteins were produced in E. coli. Next, we investigated the ability of the LjPUB13-HIS protein to interact with LjBAK1 by performing an in vitro binding assay. Similar to Arabidopsis , we observed that LjPUB13 interacts with LjBAK1, while the LjPUB13-LjFLS2 interaction is barely detectable (Fig. 5a). LjPUB13 appears to not be able to ubiquitinate LjFLS2cyt, although we tested potential capacity in the presence of three different E2 enzymes (Additional file 1: Figure S9). These results indicate that PUB13 has different molecular capacities in L. japonicus and Arabidopsis. Since LjPUB13 is transcriptionally regulated during symbiosis and the gene is implicated in sustaining nodule organogenesis, we explored the involvement of LjPUB13 in Nod factor signalling. Thus, we tested the possibility of LjPUB13 to interact with the Nod factor receptors NFR1 and NFR5. First, we investigated these supposed interactions in vitro. The cytoplasmic regions of NFR1 or NFR5 were expressed in E. coli as fusions to a HIS tag and were used in an in vitro binding assay together with the LjPUB13-GST fusion protein. We found that LjPUB13 interacted strongly with NFR5cyt, while the LjPUB13-NFR1cyt interaction was usually undetectable (Fig. 5b). Sometimes a weak interaction of LjPUB13-NFR1cyt was observed but this result was not always reproducible, and therefore cannot be fully considered as possible. Moreover, we tested whether L. japonicus BAK1, can interact with the receptors NFR1 and NFR5. LjPUB13 strongly interacts with LjBAK1 and it is plausible that LjPUB13 acts together with LjBAK1 as a complex. In addition, BAK1 is a well-known membrane co-receptor for many membrane receptor kinases . Thus, in in vitro binding assays, GST-LjBAK1cyt was indeed found to interact with HIS-NFR5cyt but no interaction was observed between GST-LjBAK1cyt and HIS-NFR1cyt (Fig. 5b). We verified the interaction of LjPUB13 with the Nod factor receptors, using a BiFC (Bimolecular Fluorescence Complementation) assay in Nicotiana benthamiana. Since the ARM domain of PUB13 is responsible for the specificity in protein-protein interactions of E3 ligases, we created a truncated fusion protein, where only the ARM domain of LjPUB13 (Additional file 1: Figure S2) was linked to N- or C-terminal half of YFP. We observed a strong reconstituted YFP signal on N. benthamiana leaf cells when LjPUB13ARM was co-expressed with LjBAK1, NFR1 or NFR5 (Fig. 6). Two other receptor-like kinases, LjCLAVATA2  and LjLYS11 , were used as negative control interactions. Indeed, no YFP signal was detected when LjPUB13ARM was co-expressed with either of the two control proteins. These results show that the ARM domain of LjPUB13 recognizes and interacts with L. japonicus receptor kinases in a specific manner. In addition, the LjBAK1-NFR5 interaction was also confirmed by BiFC in planta (Fig. 6). Finally, we examined whether LjPUB13 can ubiquitinate the Nod factor receptors NFR1 and NFR5 since LjPUB13 was shown to be a functional E3 ligase (Fig. 1b). 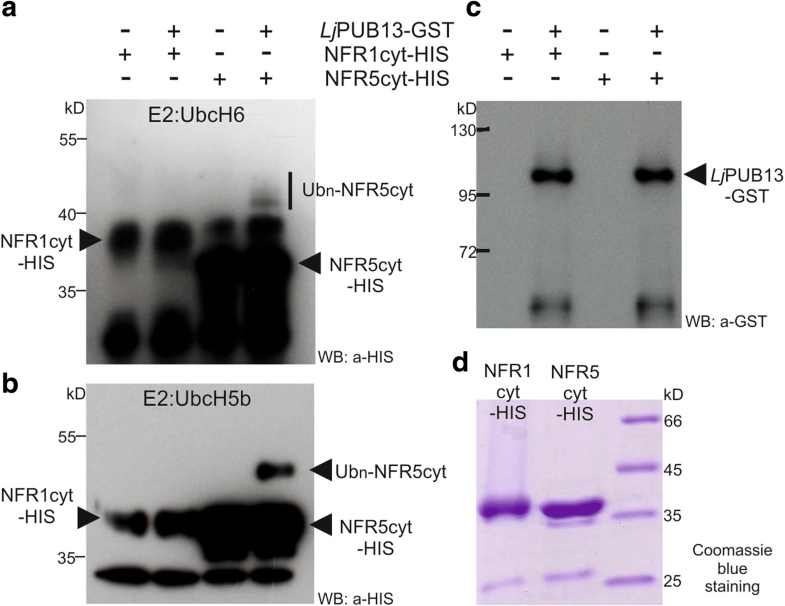 The E. coli-produced HIS-NFR1cyt or HIS-NFR5cyt fusion proteins were used together with GST-LjPUB13 in an in vitro ubiquitination assay. Interestingly, LjPUB13 polyubiquitinated the cytosolic region of NFR5 and we detected high-molecular-weight proteins above the HIS-NFR5cyt (Fig. 7). The NFR5 ubiquitination by LjPUB13 was demonstrated by using two different E2 enzymes, UbcH6 and UbcH5b. On the contrary, when HIS-NFR1cyt was tested as a substrate of LjPUB13, no ubiquitination activity was observed (Fig. 7). Thus, L. japonicus PUB13 specifically ubiquitinates the Nod factor receptor NFR5. E3 ligases were identified as important signalling components in nitrogen-fixing symbiosis in model legumes [20–25]. However, the targets of all the symbiotic E3 ligases remain to be identified and the signalling events downstream of their action remain unexplored. Here, we report that a PUB-ARM E3 ligase that possesses ubiquitination activity (Fig. 1) plays a direct role in Nod factor signalling in Lotus japonicus, through its interaction and ubiquitination of the Nod factor receptor NFR5. LjPUB13 is, thus, involved in the successful establishment of L. japonicus-rhizobium symbiosis, likely modulating the NFR5 protein levels or activity. We found that L. japonicus PUB13 is involved in the organogenesis of nitrogen-fixing nodules. pub13 mutant alleles displayed reduced and delayed nodule organogenetic capacity (Fig. 4). On the other hand, bacterial infection inside root hairs was normally sustained (Fig. 4d). This suggests that LjPUB13 is required for the signalling events that lead to nodule organogenesis in the cortex, rather than the infection events. Furthermore, considering the low accumulation of LjPUB13 gene transcripts in mature nodules (Fig. 2) and the successful colonization of nodules by rhizobium in the pub13 mutants (Additional file 1: Figure S6), we envision that PUB13 E3 ligase plays a role in the initial stages of L. japonicus-rhizobium symbiosis establishment, rather than the later stages of nodule development and colonization. The reduced nodulation phenotype could be attributed to the general reduced plant growth exhibited by pub13 mutants (Fig. 3). However, the number of nodules was significantly different in pub13 mutants from that of the wild-type plants also when expressed per unit of root length (Fig. 4b). This strongly suggests that a reduced nodulation is not directly related to a shorter root. The fact that the nodulation capacity is independent of the shoot/root length is further supported by studies in hypernodulation mutants, like har1 [31, 32], where an excessive number of nodules are produced by a very short plant (Additional file 1: Figure S4). Moreover, RNAi knockdown of LjnsRING E3 ligase, a nodule-specific gene involved in the early infection and mature nodule function , and mutation of Amsh1, a deubiquitination enzyme , affect plant growth in L. japonicus; this indicates that some proteins involved in (de)ubiquitination may act as nodes for plant growth and nodulation pathways. This is further supported by the expression of LjPUB13 observed in developing lateral roots at non-inoculated plants (Fig. 2c). The growth defective phenotype of L. japonicus pub13 mutants has also been reported for the Arabidopsis pub13 mutants . The expression of LjPUB13 observed in nodule primordia (Fig. 2), together with the findings that LjPUB13 interacts with (Figs. 5, 6) and directly ubiquitinates the NFR5 receptor (Fig. 7), strongly supports the requirement for LjPUB13 during the early stages of nodule organogenesis in L. japonicus-rhizobia symbiosis. The defective nodulation phenotype observed in pub13 mutants suggests a positive regulatory role of LjPUB13 in rhizobial symbiosis. On the contrary, the symbiotic E3s MtPUB1 and SINA4 [22, 24] exhibit a clear negative role on the early steps of the infection process. This indicates that different roles may be performed by various E3 ligases during symbiosis. LjPUB13 is the closest putative ortholog of Arabidopsis PUB13 in L. japonicus. In Arabidopsis, PUB13 has been implicated in FLS2-mediated flg22 signalling [26, 33] and, recently, in LYK5-mediated chitooctaose responses . We show here that the defence responses downstream of flg22 perception are independent of PUB13 in the roots of this model legume. In contrast to what has been reported for Arabidopsis seedlings [26, 33], our results from ROS production, and defence gene regulation (Additional file 1: Figure S7 and S8) show that LjPUB13 does not appear to be involved in flg22-dependent defence responses in L. japonicus roots. In line with this, our in vitro assays show that LjPUB13 may not directly ubiquitinate LjFLS2 (Additional file 1: Figure S9), as has been shown for its Arabidopsis counterpart . However, we cannot rule out that the involvement of LjPUB13 in plant immunity may be manifested in other parts of the plant or under conditions that have not been addressed in this study. The differences observed in plant immunity responses in L. japonicus pub13 mutant lines compared to Arabidopsis mutants, could be attributed to a host-dependent specialisation of function for these PUB proteins. Functional differentiation of orthologous PUB genes was also found for Arabidopsis PUB17 and Brassica napus ARC1 . Alternatively, a redundancy in the roles of PUB proteins in L. japonicus could mean that paralogs may be responsible for the roles that have been assigned to PUB13 in Arabidopsis. Blast analyses against L. japonicus PUB13 in Lotus base v.3.0 revealed the presence of, yet uncharacterized, proteins with similarity to PUB13. Proteins with highest similarity (appr. 50% identity) are presented in Additional file 1: Figure S1. Future studies are needed to examine possible implication of these proteins in defence responses in L. japonicus. Based on our results, we propose a plausible mechanism where LjPUB13 acts on NFR5 post-translationally. Ubiquitination of NFR5 may lead to degradation, modulation of activity or re-localization. In any case, it is expected that NFR5 turnover is essential for efficient nodule organogenesis, and the recruitment of LjPUB13 ensures the onset and/or continuation of NFR5-mediated signalling and the successful initiation of nodule formation. Along this line, and although NFR5 internalization from the plasma membrane has not been shown directly as yet, an association of NFR5 with the clathrin-mediated endocytosis has been proposed . A clathrin protein (CHC1) was shown to interact with the Rho-like GTPase ROP6 , an interaction partner of NFR5  in L. japonicus. Interestingly, ROP6 silencing in roots by RNAi did not affect the rhizobium entry in root hairs, but inhibited the IT growth through the root cortex, which resulted in the development of fewer nodules per plant . We also show that LjPUB13 physically and specifically interacts with the cytosolic regions of LjBAK1 and NFR5 in vitro and in vivo. Interestingly, the cytosolic region of LjBAK1 was also shown to interact with the cytosolic region of NFR5 (Figs. 5 and 6), suggesting that PUB13/BAK1 may act as a complex in the establishment of L. japonicus-rhizobium symbiosis. The recruitment of LjBAK1 in this case is anticipated, considering the ubiquitous role of BAK1 in interactions of multiple membrane receptors kinases [26, 34]. Ubiquitination and deubiquitination of proteins play a major role in root nodule symbiosis [20–25, 37]. Although many symbiotic E3 ligases have been identified to date, the mechanistic mode of action in the symbiotic interactions has not been elucidated, and their targets remain to be identified. In the present study, the L. japonicus PUB-ARM E3 ligase PUB13 was found to directly ubiquitinate the Nod factor receptor NFR5, and the delayed nodulation phenotype of the pub13 mutants reveal the implication of this gene in nodule development. Based on our results, we suggest that LjPUB13 has a role in the establishment of the L. japonicus-rhizobium symbiosis and acts as a positive regulator in nodule formation through the post-transcriptional control of NFR5. L. japonicus ecotype Gifu B-129 was used as a wild type control. Wild type, pub13 and har1–3  seeds were surface-sterilized as previously described  and were grown on wet filter paper for 3 to 4 days. Plants were then grown in petri dishes with solid quarter-strength B&D medium  on filter paper. The plants were grown in a vertical position in growth boxes, keeping the roots in the dark. Growth chamber conditions were 16-h day and 8-h night cycles at 21 °C. For nodulation kinetics and IT counting, each petri dish was inoculated with 500 μl of a 0.02 OD600 culture of Mesorhizobium loti cv. R7A DsRed . Nodule numbers were scored on at least 30 plants and ITs were counted on at least 30 cm of root. For gene expression analyses the plants were grown in pots with 2:1 mix of sand and vermiculite. Half of the plants were inoculated with a 0.1 OD600 culture of M. loti cv. R7A. The plants were watered periodically with Hoagland nutrient solution. For GST-LjPUB13, GST-LjBAK1cyt, and GST-LjFLS2cyt, the corresponding ORFs were PCR amplified and the resulting fragments were cloned between the EcoRI and XhoI sites of pGEX-6P-1 (GE Healthcare). For HIS-LjPUB13, the ORF was PCR amplified and the resulting fragment was cloned between the EcoRI and XhoI sites of pET21a (Novagen). Primers are listed in Additional file 1: Table S1. GST- and HIS- tagged proteins were expressed in E. coli Rosetta (DE3) (Merck Chemicals). GST-tagged proteins were then purified with Glutathione-Sepharose 4B beads (GE Healthcare) and eluted with 0.2 M reduced glutathione, whilst HIS-tagged proteins were purified with Ni Sepharose High Performance beads (GE Healthcare) and eluted with 250 mM imidazole. Plasmids with the NFR1cyt and NFR5cyt fragments cloned in pProEX-1 vector were kindly provided by Mickael Blaise. HIS-NFR1cyt and HIS-NFR5cyt proteins were expressed in Rosetta 2 E. coli (DE3) competent cells (Novagen). IMAC purification was performed using Ni-NTA columns (Qiagen). The proteins were eluted with an elution buffer containing 50 mM Tris-HCl pH 8, 500 mM NaCl, 500 mM imidazole pH 8, 1 mM benzamidine, 5 mM β-mercaptoethanol and 10% glycerol. The eluted proteins were then injected onto a Superdex 200 increase 10/300 GL (GE Healthcare) column connected to an ÄKTA PURIFIER system (GE Healthcare) and eluted with a buffer containing 50 mM Tris-HCl pH 8, 500 mM NaCl, 5 mM β-mercaptoethanol and 10% glycerol. The in vitro ubiquitination assays were performed with an Ubiquitinylation kit (BML-UW9920, Enzo Life Sciences), using either UbcH6 or UbcH5b E2 enzymes and following the manufacturer’s protocol. For LjFLS2 ubiquitination tests UbcH5c E2 enzyme was also used. All the reactions were incubated at 30 °C for 3 h, and then stopped by adding SDS sample buffer and boiled at 98 °C for 5 min. The samples were then separated by SDS–PAGE and analyzed by Western blotting, using the a-GST antibody (GE Healthcare) and the a-HIS antibody (Roche) to detect the tagged proteins or the anti-ubiquitin antibody (Santa Cruz Biotechnology P4D1) to detect the ubiquitinated fraction. For the in vitro binding assays, 2 μg of a GST tagged protein was incubated with 2 μg of a HIS tagged protein, in different protein combinations, in 150 μl of cold buffer A (50 mM Tris-HCl pH 7.5, 100 mM NaCl, 10% glycerol) with 0.1% Triton X-100, for 1.5 h at 4 °C. Glutathione-Sepharose 4B beads (GE Healthcare) were added to the mixtures and incubated with the proteins for 2 more hrs at 4 °C. The beads were then washed 3 times with cold buffer A. The bead-bound proteins were analysed by immunoblotting, according to standard protocols, using anti-GST (GE Healthcare) and anti-HIS (Roche) antibodies. To test the temporal and spatial expression of LjPUB13 in non-inoculated and M. loti inoculated L. japonicus plants and the expression of defence genes after treatment with flg22, analysis by qRT-PCR was performed as previously described [45, 46]. Gene primers are listed in Additional file 1: Table S2. For the promoter-GUS-terminator construction, a 1475 bp promoter with a 5′ untranslated region (UTR) and a 310 bp terminator region was amplified from L. japonicus genomic DNA (the primers are listed in Additional file 1: Table S3) and cloned into GoldenGate vectors . The PCR fragments were firstly cloned into GoldenGate Level 0 vectors before being assembled as a construct (promoter:GUS:terminator) in a modified pIV10 vector . The construct was transferred into A. rhizogenes AGL1. Hairy root induction using A. rhizogenes was performed as described previously . Chimeric plants were transferred into magenta growth boxes containing a sterilized 4:1 mix of clay granules and vermiculite as well as ¼ strength B&D medium supplemented with 1 mM KNO3. For inoculation, liquid cultures of M. loti cv. R7A expressing DsRed were grown to an optical density of 0.02 and applied directly to the root systems (0.7 ml per plant). Plants were grown at 21 °C (16 h light, 8 h dark) and harvested at indicated times post inoculation. GUS staining was performed as described previously . Whole roots were visualized on a Leica M165 FC stereomicroscope. For inspection of infection-thread formation, roots were harvested 10 and 14 days after inoculation with M. loti strain cv. R7A DsRed. Sections (1 cm) of at least 30 plants were examined under a Zeiss Axioplan 2 fluorescent microscope. Seven-day-old roots were cut into 0.5 cm pieces and incubated overnight (with shaking) in 200 μl water in 96-well plates (Grenier Bio-one). Before the measurements, the water was exchanged with 200 μl of buffer (20 mM luminol, Sigma; 5 μg/ml horseradish peroxidase, Sigma), supplemented with either H2O or 0.5 μM flg22 peptide (FLS22-P-1, Alpha Diagnostic). Luminescence was recorded with a Varioskan™ Flash Multimode Reader (Thermo). The ARM domain of LjPUB13 (Additional file 1: Figure S2) and the full length LjBAK1 were cloned, using Gateway technology (Invitrogen), into the pGREEN029:35S:GW:nYFP/cYFP vectors creating N- and C-terminal fusions to YFP. The primers are listed in Additional file 1: Table S3. The NFR1 and NFR5 fused to nYFP/cYFP constructs used were the same as those described in . Agrobacterium tumefaciens AGL1 cells transformed with the protein expression plasmids were grown in 5 ml LB medium supplemented with appropriate antibiotics at 28 °C. Bacteria were pelleted by centrifugation at 4000 g for 20 min at room temperature and re-suspended in agroinfiltration medium (10 mM MgCl2, 10 mM MES and 450 μM acetosyringone), incubated for 2–3 h in the dark and finally re-suspended to an OD600 of 0.2. A 1:1 mixture of cultures was prepared for each construct combination together with the P19 construct (to an OD600 of 0.02). A 1-ml syringe was used for infiltration of the bacterial mixture to the abaxial side of the Nicotiana benthamiana leaves. Fluorescence was detected using a Zeiss LSM510 confocal microscope. Differences in the tested biological parameters between mutant and wild type plants were analyzed by Student’s t-test. A significant level of 5% was applied. The authors wish to thank Prof. Jens Stougaard (Aarhus University) for scientific support and for making corrections and comments on the manuscript; and Prof. Claus Schwechheimer (Technische Universität München) for hosting DT in his laboratory by providing financial support through the SFB924 and for making comments on the manuscript. The authors thank Mickael Blaise for providing the plasmids for HIS-NFR1cyt and HIS-NFR5cyt protein expression, Zoltán Bozsóki for helping with the ROS assay, and Finn Pedersen for taking care of the plants in the greenhouse. This work was partially supported by the Postgraduate Programs 3817 & 3439 of the Department of Biochemistry and Biotechnology, University of Thessaly (to KKP). DT and SR were supported by the Danish National Research Foundation grant no. DNRF79. DT was supported by a STSM (290713–031130) from Cost Action FA1103. The LjPUB13 sequence is available in GenBank under the accession number KY131979 and in Lotus base v.3.0 (https://lotus.au.dk/) as Lj3g3v3189730.1. Other sequence data from this article can be found in the GenBank under the following accession numbers: LjBAK1 (KY131980), LjFLS2 (JN099749), NFR1 (AJ575249), NFR5 (AJ575255). KKP, SR and DT conceived the research plan; DT, EER, ISP, JEW and DBJ conducted experiments; KKP, SR and EI supervised the experiments; EI provided training to DT in biochemistry; DT, SR and KKP analysed data; DT wrote the article with contributions of all the authors; SR and KKP complemented and revised the writing. All authors read and approved the final manuscript.